Gorkha Development Council (GDC), one of the 31 development councils of Assam demanded an amount of Rs 20 crore for its 2019-20 budget for socio-cultural development of the Gorkha community of the State. Disclosing the resentment of the council over the meagre amount of Rs 35.10 lakh by the present state government to the GDC for 2019-20 budget, vice chairman of GDC and convenor of all existing development councils, Ganga Poudal said that the amount seemed to be lollypop to the community which would be minimum to execute any developmental schemes as the Gorkha community with 25 lakh population is scattered everywhere and the GDC has to rationalize the fund allotment for development. He further informed this correspondent that even though Bhaskar Sarmah, MLA of Margherita LAC and R P Sarmah, MP of Tezpur too intimated the chief minister Sarbananda Sonowal and finance minister HImanta Biswa Sarma to this effect and the finance minister too assured to process it within the current financial year, but nothing was done in reality. 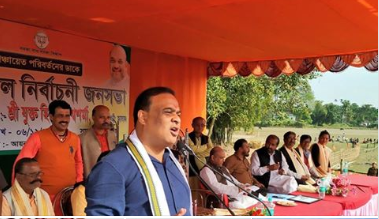 The GDC vice chairman who is also the coordinator of the development councils added that other development councils of the state too are unhappy over the state government’s attitude and appealed to go by the manifesto of the BJP which is committed for ‘sabka saath, sabka bikash‘.